It’s been awhile since I shared a salad recipe. For some reason, cheesecake seems to get more “likes” than salad. But I wish it didn’t! This one is from Appetite For Reduction, and it’s the perfect time for it. Beets are still abundant and citrus, although imported, is in season. This recipe is a cooking lesson unto itself — you’ll learn a quick and yummy way to prepare roasted beets with no oil, how to create beautiful gems of orange segments and how to toast sesame seeds. Making it once will give you a few skills that will last a lifetime and you will never have to read the recipe again. But educational merits aside, it’s also incredibly delicious. A wonderful combo of earthy, sweet, and tangy with a little Asian flair. And hey, if you’re just in the market for a really simple and tasty salad dressing, the vinaigrette is pretty amazing on everything! ~Wild rice has an alluring earthy flavor, but the price can be not so alluring. If your budget isn’t feeling wild about it, go for a wild rice blend instead. That’s got some long grain brown rice thrown in to the mix, but you still get that wild rice taste, texture and color. First prepare the orange segments. Slice a thin layer off the top and bottom of the orange, then place the orange right side up on the cutting board and simply slice the peel downward, using a chef’s knife and following the natural curve of the orange. A little of the white part (called the “pith”) is okay, just try to get as much orange as you can. Then slice the orange widthwise and cut each piece into 3/4 inch segments. Then toast the sesame seeds. Preheat a small, heavy bottomed pan over low/medium heat. Add the sesame seeds and stir often for about 2 minutes. They should be toasting up by then (if not, then raise the heat). Use a spatula to toss continuously for another minute or so, until they are varying shades of toasty brown. Remove from pan ASAP to prevent burning. Pour the dressing into a large mixing bowl. Add wild rice, currants and lettuce. Using tongs, toss to coat. Add oranges and sesame seeds, and toss again. Lastly, fold in the beets. Serve. This dressing is heavenly; fruity, toasty, spicy and tangy. Toasted sesame oil is kind of a godsend for dressings because it has so much flavor and a little goes a long way. Make sure your sesame oil is labeled “toasted sesame oil.” Toasting the seeds brings out a lot of bold flavor, where regular sesame oil might just fall flat. It’s usually found in the oil section of the supermarket, although sometimes it can be found in the Asian aisle. Vigorously mix together all ingredients. Just mix them right into a measuring cup so as not to make too many dishes. If you’re using it for a grain salad, you can also mix it directly into the large mixing bowl that you will use to prepare your salad. Keep refrigerated in a tightly sealed container until ready to use. Put me down for ‘bowl of jewels.’ 🙂 This looks beautiful, not just for the eyes and the palate, but also for the body and soul. Thank you for sharing! This looks delicious! I think I’ll make it in place of the tossed salad for Christmas Even dinner. Thank you! This salad is heavenly… Layers of lip-smacking flavour from the tart orange, to the sweet beets and currants, to the toasty, nutty flavour of sesame, all combined with several enjoyable textures: crisp, chewy, crunchy and soft. YUM. I’m putting the ingredients if this on my shopping list tonight!!! I love all the recipes from Appetite for Reduction. It is now my #1 cookbook. But I especially love the salads! When I made this recipe, I was a lazy sod and didn’t want to buy wild rice, so made it with 2 pounds beets instead. Still amazing! I even bought this book for my mother-in-law, and she loves it too! I love this recipe! I tend to eat it warm with a bit more rice and without the lettuce, and it’s just such a wonderfully distinctive combination of flavours and colours. I was a bit apprehensive about AfR being a low-fat cookbook to begin with, but I cook from it so much! mmm. I can’t wait to try this! I love beets! 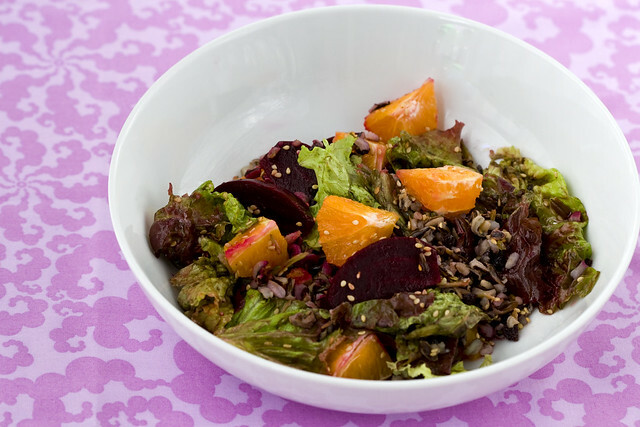 Roasted Beet, Orange and Brown Rice Salad with an Orange Sesame Vinaigrette « the taste space – steam, bake, boil, shake! You speak my thoughts, everyone likes the cheesecake and barely gives the salad a glimpse. Nothing is more irritating to me than, oh new diabetic cookbook on desserts. No, I don’t have diabetes. Since I hate beets-maybe sweet potatoes? Isa, I’m eating this salad right now and it is delicious. 😀 Thank you! What do you mean by “grain salad”? Looks like it’s the best wild rice salad I’ve ever seen! According to statistics, Minnesota eliminates important protections and precautions for wild rice. The bioreactors influence it immensely. Checking the news and updates on achieveessays and WildPlanetCoast.